You too can be a "bird watcher"
My brother and I are both into bird watching. The only difference is, his bird watching occurs in the daytime. I've been spotting satellites in the sky for well over 25 years. Problem was, I didn't realize it until about the time I graduated high school. I don't remember when I saw my first artificial satellite, but I do remember it was during a meteor shower while at my grandparents' home in "the sticks" of upper east Tennessee. The sky was clear, there were no city lights to obscure, and the Milky Way was as spectacular as you could imagine. I spent many a night getting up late/early to catch a meteor shower, usually in the late fall or winter (around the time of the Leonids), and we'd trudge from the house to the nearby field some 100 yards away, where we'd hop on a flatbed hauler and and stare skyward, wrapped in sleeping bags, comforters, blankets, and thick jackets. Every so often, amongst the skimmers, fireballs and bolides I would see what appeared to be an airplane. But I wouldn't hear any sounds, see any blinking lights, and it would occasionally disappear into thin air. None of us really knew what they were (my mom would assume an airplane too high to hear) and I'd call them "crazy stars". Hey, I was, what, 12, 13 years old at the time? At that age I couldn't spot the Big Dipper, Little Dipper, Orion, Draco, Aries, Vega, etc. I knew the moon was up there and that was it. Heck, to me, the body of Orion looked like the Big Dipper, and the Pleiades were the little dipper. I thought this for years until I got into high school. Only in the last few years have I been able to tell a few constellations here and there. It helps to know your constellations when looking for satellites. I've seen several types of satellites, from the Space Shuttle to the Mir, from the ISS to spy satellites. There are a lot of them up there. There are thousands of objects in orbit, most are space debris, such as spent rocket motors, dead satellites, or in some cases items that shed from satellites. Of the thousands of objects in orbit, many are too small to be tracked. So, how is it possible we can see a satellite in the middle of the night? Quite simply, it's dark on the ground, but up in space where the satellite is, the sun is still shining. It will reflect the sunlight off the body or the solar panels, or both, and those who are looking up can possibly see it cruising by. Usually when you see them, they are going into the orbital sunrise or sunset, where the satellite is going into or coming out of the dark side of the earth. Many satellites are polar orbiting, such as NOAA's weather satellites or reconnaissance satellites for the military. Most of the satellites you can see are called Low-Earth-Orbiting satellites, or LEOs. They are usually between 100 and 500 miles above earth and circle the earth between 90 to 100 minutes. Normally they range in size from disco balls to that of a school bus. The largest (and brightest) man-made satellite is the International Space Station. We'll start with that one. The ISS is about as bright as Venus when it moves across the sky. Even in the largest of cities, the ISS can still be seen. It takes little effort to view the spacecraft, just a clear sky and a viewing opportunity will be all you need. Sometimes the occupants may be on the station's ham radio, but it depends on the crew's time, and desire to talk. So the big question is when and where? The best source for starters is the NASA website for novices. Input your country, then state, then city, and you'll get a listing of possible sightings over your city. 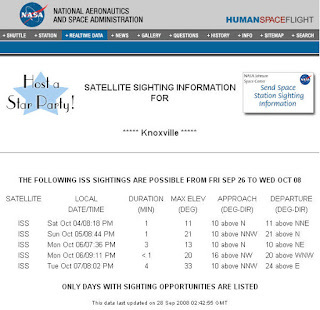 In the image shown, the passes for the ISS over my hometown are listed. The MAX ELEV is how high above the horizon (in degrees) the ISS is travelling over my location. 0 degrees is the horizon, and 90 degrees is overhead. The APPROACH and DEPARTURE listings tell you where to look in relation to North. What you will see is an object that looks like a star or planet (again, as bright as Venus or Jupiter) but is slowly moving across the sky. No blinking lights (that's an airplane) and no sound. If it disappears, it's gone behind the dark side of the earth and out of the sunlight. This will happen after sunset. In the mornings the ISS may suddenly appear out of nowhere as it enters an orbital sunrise. In the video above, you get an idea what you would be seeing, but a lot brighter than the picture gives justice. Another web site I recommend for satellite watching is Heavens-Above.com. Heavens-Above has a large satellite database that you can reference. You can register, enter your location (by city, or even by your coordinates) and you can get pass information on various kinds of satellites. Yet another website with a more in-depth scope of the satellites and various kinds of passes is CalSky. It takes a bit of getting used to, but it's very good at detailing more satellites and more passes of various kinds of "birds". Real quick, how exactly do these web sites know when a satellite will pass over? A set of mathematical elements known as Keplarian elements are used. By using these elements, these web sites (or with some satellite tracking software) can predict with remarkable accuracy the location, distance, height, speed, and trajectory than an object is traveling around the earth. These elements are updated almost daily by NORAD, which tracks these orbiting objects constantly. Okay, so I've started you out with the ISS, and given you some sites. Now I want to discuss what kinds of satellites you might see. We've covered the ISS, but the Space Shuttle and the Soyuz and now the Chinese Shenzhou vehicles are also flying up there are manned space vehicles. I've see the Shuttle before, during, and after docking with the ISS and Mir. One morning a few years ago, just out of the blue, I woke up around 5:30 in the morning. I turned on the TV to NASA Television and found that the shuttle (launched the day before) was flying over Tennessee and about to enter an orbital sunrise, so I quickly rushed outside. No sooner than I look up do I see the Shuttle coming out of the dark straight overhead and zipping off to the Northeast on its way to rendezvous with the ISS some 24 hours later. I have seen the Soyuz once or twice, the Shuttle countless times, and the ISS is a regular guest. I have yet to see the Shenzhou vehicles. Usually by the time the elements are published by NORAD and trickled down to the public sites, the Soyuz and Shenzhous have docked or landed. Notice the steeper "sine wave" of the ISS orbit. As you can see, more of the earth's land is covered by the ISS. This allows more sighting opportunities in the higher lattitudes like Alaska and Canada and even Antarctica. Canada never sees HST. However, those in the higher lattitudes aren't out of luck. The polar orbiting satellites are plentiful and are visible even from the poles. The image above is of a polar orbiting satellite. While not completely vertical, you can see that the orbit is almost in synch with the solar terminator and is nearly in constant sunlight. 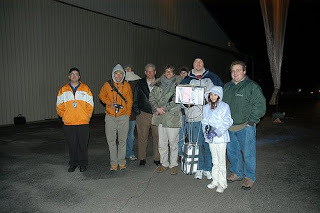 This is advantageous to those looking for birds during the winter, when the increasing darkness decreases the opportunities to view the lower lattitude satellites such as HST. Inactive space vehicles are satellites that have died or malfunctioned, or rocket parts and motors that were used to carry the working satellite into orbit and were separated from the working satellite and placed in a decaying orbit that will eventually cause it to burn up in the earth's atmosphere. Inactive satellites are basically space junk that are uncontrolled and their orbital track seldom changes. Many of the inactive/junk satellites will actually be tumbling or spinning, and will flash as it passes overhead. Other satellites that are active may get brighter or dimmer as the sunlight reflection off the solar panels change. Zi Yuan 2 is an example of a tumbling satellite. Launched by the Chinese as a reconnaissance satellite, it is in a polar orbit that keeps it nearly in constant sunlight, and it will often pass overhead and vary in brightness from nearly invisible to extremely bright. Another tumbler that caught my attention is the SL-16 Rocket Booster (R/B). I was looking for the ISS one night and saw this bird coming from the southwest, but thought it was an airplane. My attention was diverted to another satellite but this one kept in the corner of my eye until I finally focused on it and realized it was in fact a tumbling satellite, and spinning very rapidly. Definitely worth looking for. It's hard to see the tumbler until halfway through the video. Sometimes Heaven's-Above and Calsky will not list tumbling satellites when doing a search on satellites that pass over your location, due to their varying brightness. But they are a great resource for locating Iridium flares, even in the daytime. So, can you view satellites from anywhere? Pretty much. The ISS being the biggest object and the brightest, it can be seen from downtown Manhattan. Other satellites, however, require a bit of work. But even with my being on the fringes of the city, I can see even the dimmest of satellites using a clear sky and a pair of binoculars. More often than not (and comparatively speaking I'm still a novice) I see satellites that don't show up on the lists I create from these web sites. I will post to a mailing list I'm subscribed to and the users on that list will often pinpoint the satellite I was viewing. A clear and dark sky is your best setting for spotting satellites. I've gone back to my grandparents' home on occasion, my mother-in-law has some land with no nearby lighting, and I've even gone up to Clingman's Dome in the Great Smoky Mountains National Park to spot many of the dimmer ones. If you can see the Milky Way, you are in an ideal location for "bird watching". I hope this is a good starting point for you. There are plenty of resources online to help get you started in the hunt for satellites. Get started with the ISS, and go from there. There are many who have turned satellite watching into an art form. They even go after the geosynchronous satellites, especially during the periods when the sun is at the equatorial region, and the chances of catching a geosat flare are most likely to occur. You don't have to be an expert, you don't even have to run pass predictions to step outside and look up for a few minutes after dark or before dawn. But it helps to know what you're looking for, and when and where. So step outside tonight and do a little "bird watching" of your own. Two new hams in my family? On the way home from visiting family, I talked to my daughters (ages 8 and 6) and asked them "so, would you like to learn how to be a ham operator?" and enthusiastically, both answered "yes" repeatedly until I told them I got it. It made me feel good to know they were both interested. Already, I'm thinking about those applications to the ARRL for scholarships in 10 years...better keep my membership current!!! It's not too terribly surprising, really, at least for the older of the two. 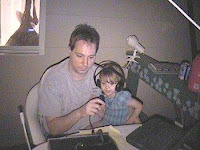 Lauren's been listening to me talk on the radio during Field Day (the above picture was taken when she was two), launch balloons, and even read off a weather warning during a recent SKYWARN net. Some friends of ours from Bristol, TN have a son who go his ticket about a year or so ago. He's active in their SKYWARN group and likes it thus far. So now I have at least one who's looking to get ticketed soon, my other one, Amber, I'm not so sure of, at least not yet. Granted, if she got her license it would be big news around here since she's 6 (7 in a couple of weeks) and to have both of them licensed might turn a few heads. Question is, how do I teach them, and how will they administer the exam? I'll probably start online and look over the sample questions, then talk with them about what this means, or what that indicates, or how something works, etc. Then we'll see if they're still interested. Between Brownie Scouts, school and the possibility I may become a soccer mom before too long, I don't know if I'll keep their attention long enough to get their ham tickets. I know that the VEs can administer an oral exam, which they'll have to do for Amber since she's not reading at that level yet, and probably give one to Lauren. Even though she's an excellent reader, she sometimes has issues with the comprehension, and I don't want her to just memorize the questions and answers, I want them to understand why something works this way or that. We at TWIAR pride ourselves on reliable information and smart news stories and headlines. Unfortunately we don't receive any money for it. If pride were a commodity, TWIAR would be the New York Times of journalism. However, those newspapers that DO get paid to report the news occasionally overlook the obvious. I received this email earlier today. It reminds us that the media occasionally gets it wrong. So I was browsing the Coke Rewards site while on lunch today, and was somewhat taken aback by what appeared to be a really weak photoshop job by the Coca-Cola folks of pasting gymnast Shawn Johnson's head over someone else's in a shot showing "Olympians" with Coke gear. I've just set up a Twitter feed for TWIAR. If you have a Twitter page, please start following us. You can take the RSS feed from the page and add it to your site, you can set it up to send the updates to your mobile phone, and you can get the latest in amateur radio news, from TWIAR, the ARRL, or any publication featuring amateur radio from around the world. The Twitter page will be updated with the latest news in amateur radio, and if there's any info on TWIAR itself (new editions posted, problems with audio uploads, etc) and messages of interest to our TWIAR listeners.